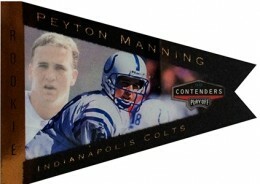 The 1998 Playoff Contenders Peyton Manning Rookie Ticket Autograph is one of the crown jewels of the modern hobby. 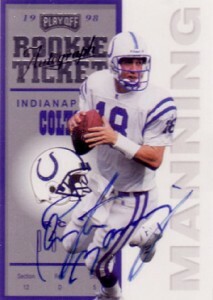 It's the lone autographed rookie card of one of football's greatest quarterbacks of all-time. It's also extremely pricey, which means a lot of collectors can only dream of owning one. However, it's not the only Peyton Manning card in the set. 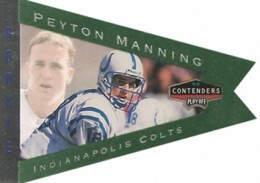 1998 Playoff Contenders Football has several Peyton Manning inserts that are much more affordable to the average collector. Not only are they more affordable, but they come with some unique designs. 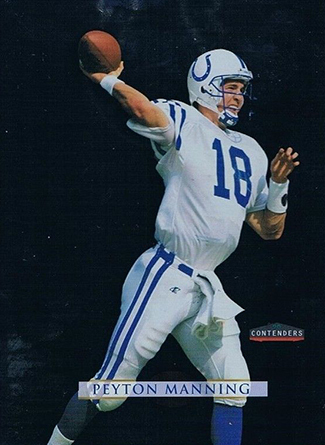 To most, this is the ultimate Peyton Manning card. 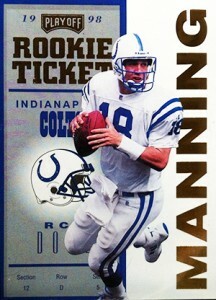 Besides being the only signed Manning rookie, it's limited to just 200 copies. In addition to the regular Rookie Ticket Autograph, there are a couple of unsigned parallels that can be found in packs. The Red version is the most common and worth significantly less. A Gold version is numbered to 25 and doesn't show up very often. Because of the print run, it commands very strong prices. 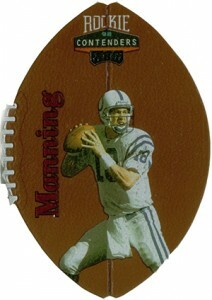 This is one of several die-cut Peyton Manning inserts from 1998 Playoff Contenders Football. Not only is it cut in the shape of a football, but it mimics the texture of one as well. Like the Rookie Ticket, there are Red and Gold (#/36) parallels that have different colored lettering. Another die-cur insert, Pennants come in several versions. Most are based on the color of the felt. These felt versions all sell for similar amounts. 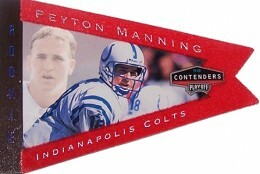 They're actually very affordable for a rookie-year Peyton Manning insert. 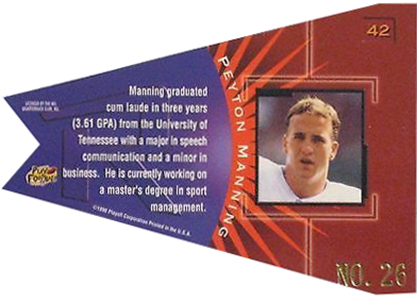 The Gold Pennant is numbered to 98 is the notable exception and sells for several hundred dollars. 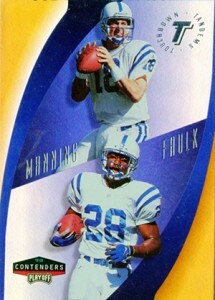 Every 1998 Playoff Contenders Football hobby box has one of 30 different over-sized checklists. Each team in the NFL is represented in the set, usually with a superstar veteran. 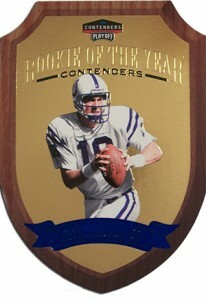 That put Manning in good company considering he was a rookie. 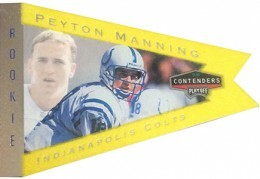 Inserted 1:55 packs, this is one of the toughest inserts in 1998 Playoff Contenders Football. At 12 cards, the checklist isn't huge but this is still a relatively tough card to find. And it looks pretty cool, too. The die-cut design is intended to mimic a plaque. Gold and blue foil further add to its look. What's this? 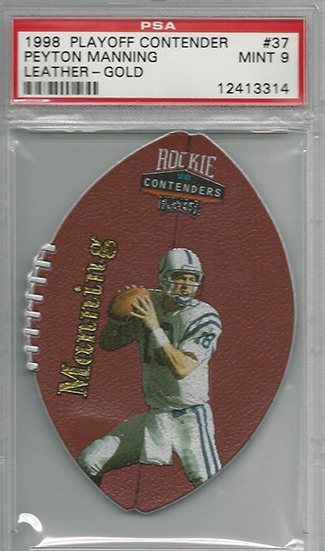 An insert from Contenders that isn't die-cut? 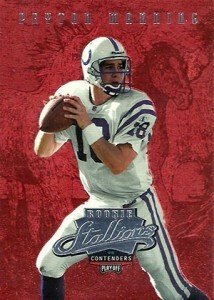 That doesn't stop the Rookie Stallions Peyton Manning card from looking distinct. The bright red foil background has a definite Precious Metal Gems vibe to it. All that said, the cool look hasn't translated into big values. 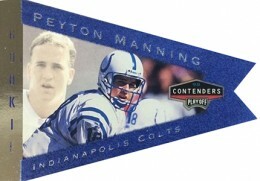 This is one of the most affordable Manning cards in the set. This is the least desirable of the Peyton Manning cards in 1998 Playoff Contenders and can be found for just a few dollars. To help encourage collectors to build sets, Playoff has a special exchange program to go the release. Very few took them up on the offer. Registered Exchange cards are available for the Rookie Ticket Autograph (#/8), Leather (#/51) and Pennants (#/51) cards. They're essentially the regular card but with a gold serial number on the back. Given their extreme rarity, don't expect to see them up for sale very often. 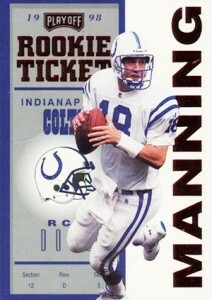 Now that Manning has etched his name in the record books so many times, it wouldn't be surprising to see some new records the next time the 1998 Playoff Contenders Rookie Ticket Autograph Registered Exchange Peyton Manning is made available. 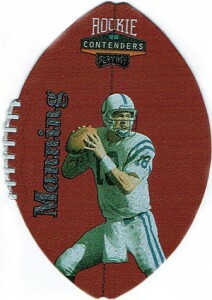 A master set of 1998 Playoff Contenders Football were stamped on the front as a "Proof Set" and auctioned off at the 1999 Kit Young Hawaii Trade Conference. Every Proof Set card is a one-of-one so it's unlikely you're going to see the Rookie Ticket Autograph surface more than once or twice (if ever). Original article by Ryan Cracknell.